How to Perform Form Calculation in the Matrix Field? It is now possible to use the Matrix field to perform form calculation. Here in our example, we will set the matrix field similar to a survey questionnaire with ratings or value on them, we will calculate the total rating using the Form Calculation widget. You can follow the steps below on how to do that. 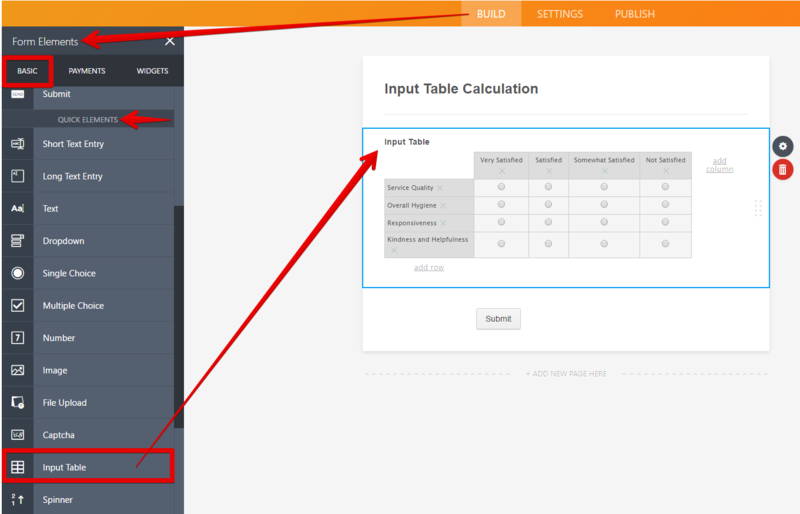 In Version 4.0, we call the Matrix Table from Version 3.0, Input Table. 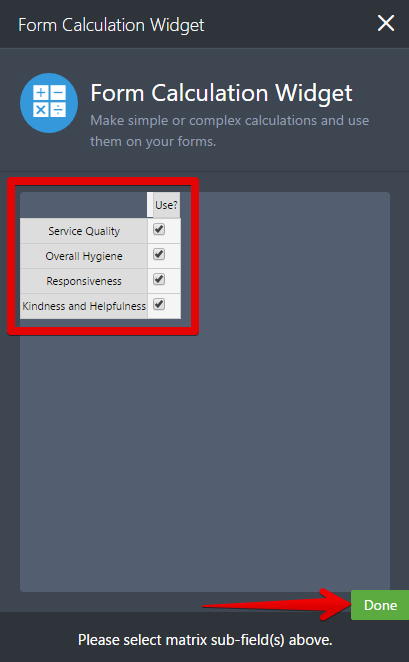 It can be found in the Quick Elements section of the Basic tab when you add Form Elements to the form. Once you've added the Input Table, select an input type from its properties (cogwheel icon). 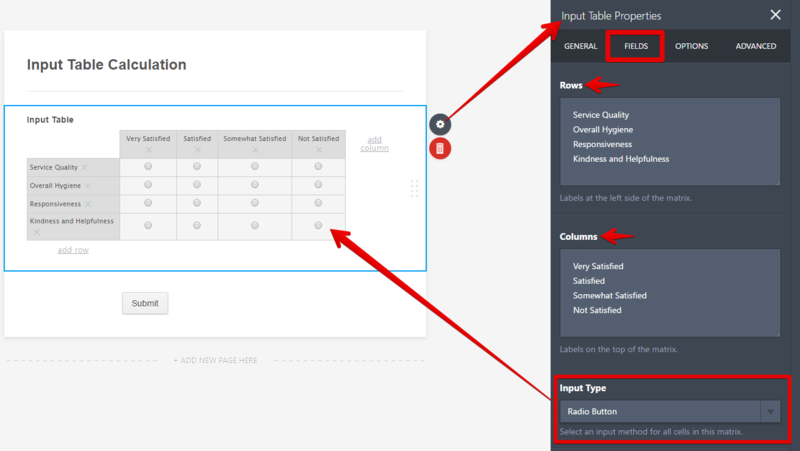 From the same Fields tab of the Input Table properties, you will be able to set row and column headers. After constructing the table, you now need to set calculation values for each of its cell (matrix sub-field). To do that, go to the Options tab and enter the values in the provided text area for calculation values following this simple rule, "Separate each column with a comma and each row with a new line." In the example above, 4 Rows means 4 lines and 4 columns means 4 values separated by a comma. Note: Choosing a different input type for the table, like a text box or number text box, if you want your respondents to define values for each cell, will not require you to set calculation values. 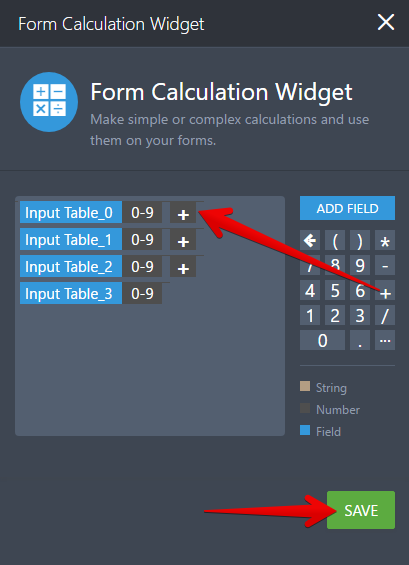 To get the total value of the selected cell(s) on the table, you will use the Form Calculation widget from the Widgets tab when you add Form Elements to the form. 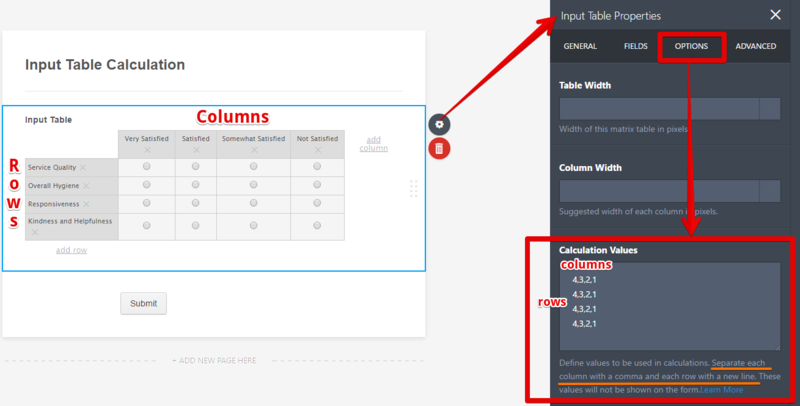 To perform the calculation, you need to add the input table to the calculation area of the Form Calculation widget. Clicking the "Add Field" button shown in the screenshot above lets you add fields to the computation. 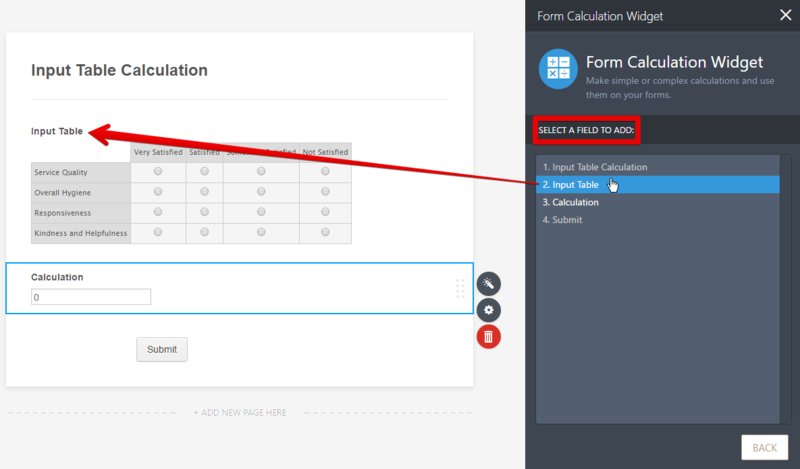 After selecting the matrix sub-field(s) and clicking Done, you will see the selected sub-fields of the input table in the calculation area of the Form Calculation widget. From there, you will be able to create your own formula to get a total value. The calculation pad on the right will surely help you with the simple to complex mathematical tasks. You can check the sample form here: http://form.jotformpro.com/form/51691444490963? Do you have questions about this guide? Please let us know in the comment box below or post it to support forum. How can I multiply qty and price= total and the whole total? How can this function be used using the "drop down" selection with more than one value can be selected? The answer to my comment below just gave me a link to this web page on which I had the "How to" question." As I understand it, I do not need a calculation. I just need to be able to move the contents of a field previously entered into one or more of the rows and columns in a table. Please clarify your response. How can I set the value in a table cell (As an example: Row 1/Column 1) equal to a field entered above? I have a table with 6 rows and 3 colums. The fields of the colums (radio buttoms) are : choice 1, choice 2, choice 3. Is it possible to limit the form to only one choice 1, only one choice 2, olny one choice 3, in the table ? for the emoji's the calculation is coming wrong for a 5 point scale..it still shows up with 7 points. what can we do to fix this? Hi - I am using radio buttons in a table and I want the person to be able to select multiple options in a row if they so choose - how can I do this? I'm trying to total a column using the Form Calculation Widget and I don't know what I'm doing wrong. I can't seem to get the + sign after the added field and then the numbers are calculating higher than they actually are. I put in 10 and 10,000 is showing up in the calculation field. Am I able to have two separate calculations for one table? For example, I am using as a daily time sheet and have a column for regular hours worked (which is calculating correctly) and a column for overtime hours worked (which is only duplicating what is in the regular hours field). I am doing the formulas the exact same for each different column but not getting two separate answers. Can I make it so that each drop down option can only be used once? How can I delete a field and add a different field from the add field button? I want to assign values to each question in my matrix, but I don't want the person filling out the form to see the value. I only want to be able to see it. Is this possible? I am hoping to get some help here because I am sure this is possible and I am simply missing how to do this. This is a limo company with a few variables. Lets make it simple and say we have limoA, limoB, and limoC. Each of these limos have an hourly rate for Weekday, Friday, Saturday. How would I set this up so the customer could fill out the form select the day of the week, use a check box form to select what they want quotes on, then depending on the hours selected multiply the value by the hours? I wanted to know if it were possible to create a calculation in the actual matrix. For example, a cell in the matrix equals a date that someone put in above the matrix. I am trying to count how many checkboxes are checked in a matrix. I am trying to figure out how I can set the value of each checkbox to 1. I know that I can insert 1, but I don't want that to show in the headers. If I hide the headers, then the months can't show. I need to be able to show the months across the top. Do you have any suggestions for how I an do this? Can I set condition on form matrix calculation? For example if column 5 as remarks says Best, the calculator will just compute all fields (rows) with best. Is that possible? Thanks. I have a set of 28 questions and 5 radio columns (Never, Rarely, Sometimes, Very often, Always). a) How do I set values for each column and when they are selected, the values are added up? e.g. Never=1, Rarely=2, Sometimes=3, Veryoften=4, Always=5 if Never is selectedx2, rarely x1, always x2 = the total is 14.
b) How do I set the 28 questions to calculate 4 different totals from the above columns. eg. Qs 1-7, 8-14, 15-21, 22-28 and then set a formula to only show the results for the highest total? How do I multiply the value of column 1 and column 2 and show the result value in the column 3 of the matrix table? I've created a matrix question with dropdown list "yes" and "no" and I wwould like to add the values to the "yes"=1 and "no"=0. my question is: can I use the same role live above : yes1? what is the css code to hide the numbers? I have tried to output the sum of a matrix's fields multiple times. Every time I save the logic the fields are removed and all I am left with in my equations is the addition signs.